Everyone knows Toro as a beloved brand of lawn and garden equipment. Many Toro products are geared toward the home owner, but the quality and features are always present. Independent Toro dealers exist for the higher-end machines, but the homeowner can shop the big box retail stores for the lower priced machines. The Toro leaf blower can be either electric or gas powered. Toro Blower Model 51602 is a versatile little electric machine that features a 2 speed motor, multiple tubes for different applications, and quick conversion that switches the blower into a vacuum in minutes. When used as a vacuum, the leaf reduction ratio is 10:1, meaning 10 bushels of dry leaves are reduced to a very manageable 1 bushel after pick up. The 12 amp motor produces a air speed of 230 MPH, moving a maximum of 330 CFM. The weight is a reasonable 7.4 lbs. Plan on spending about $70.00 for this economical machine. Model 51609 is an upgrade of the Model 51602. This is another electric machine that blows, vacuums, and shreds leaves. The impeller is made of very light magnesium, and has serrated edges to make leaf shredding all the more efficient. This beauty of a machine has an outstanding leaf shred ratio of 16:1, meaning 16 bushels of dry leaves are reduced to a pile of well behaved mulch measuring 1 bushel! The motor has an infinite speed control, so you can match the power needed to the job at hand. A cord storage hook allows you to store the electrical cord with the blower. The extra features do not really increase the price that much. This little beauty goes for about $80.00. The toro leaf blower Model 51585 is just that - a blower, without the capability to be used as a vacuum. The 2 speed motor produces 167 MPH air speed, and the entire unit weight a measly 5 lbs. The price is right, also - just $35.00. Toro rake and vac Model 51585 features a 2 speed 10.5 amp motor that produces 210 MPH maximum air speed. This model will blow, vacuum, and shred leaves to a ratio of 8:1, which is a little on the low side. Count on spending $65.00. The Toro super blower vac Model 51585 has a 12 amp 2 speed electric motor rated at 230 MPH air speed, with 255 CFM capacity. This machine weighs in at 7.4 lbs, and has a leaf shredding ratio of 10:1. No tools are required the blower into a leaf shredder. The price is $70.00. The Top of the Line Toro leaf Blower is Model 51585, the Ultra Blower Vac. The electric motor is 12 amps, and has infinite speed control and a metal impeller to give a superb mulch ratio of 16:1. The air flow is 255 CFM, with a speed of 235 MPH. This top of the line Toro electric goes for about $90.00. 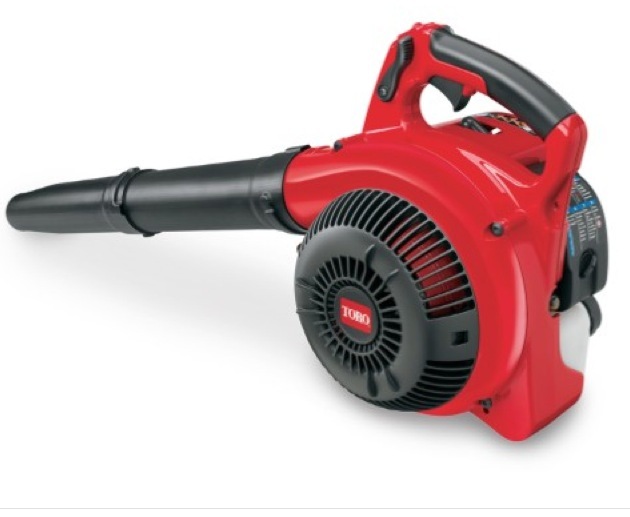 There is one model Toro leaf blower that is gas powered - the infamous (at least among Toro fans) Model 51984. This is a 2 stroke engine with a 25.4cc displacement, that blows, vacuums, and mulches. The shredder blades are metal, so leaves are shredded on contact. The mulching ratio is 10:1, with a rating of 420 CFM air flow traveling at 160 MPH. The weight is a very reasonable 9.7 lbs. The price for this red workhorse is about $160.00. The Toro line of string trimmers lives up to the company’s reputation for a quality homeowner machine.